The 2018 Star City Games Team Constructed Open was held in “Philadelphia” (the location of the event was about a half hour drive away from the actual city) this past weekend, and given that it’s the first major paper tournament that’s been held within an hour of me in a long time, I resolved to attend. I wasn’t able to wrangle a Legacy player in order to enter the team event, so I decided to play in Sunday’s SCG Classic instead. I had a pretty good run at the event, and scored a Top 16 finish with Merfolk. In this article, I’ll give you a rundown of my tournament experience, and some of the observations I had about my deck, the field, and the Modern metagame. The first question that had to be answered once I registered for the Modern Classic was deck choice: I am primarily a Merfolk pilot in Modern, and I feel very comfortable with the timeless mono-blue list. However, as I had mentioned in my piece discussing the Rivals of Ixalan spoilers, I have been testing UG Merfolk. I have made some edits to the list I proposed in that article (namely dropping the underperforming Merfolk Branchwalker in favor of Merrow Reejerey). My most recent UG list has been performing at a high level in Magic Online leagues, and I found myself somewhat torn as to which paper deck to sleeve up. I ultimately chose mono-blue, in large part because of my greater familiarity with the deck, which is something I consider to be highly important in Modern. Note the high counts of every card I have chosen to include; I run no singletons (besides the legendary lands), and only a handful of cards at two copies. I feel strongly that one of Merfolk’s major strengths is being highly consistent and redundant, and I have built my deck to maximize that trait while still packing a diverse suite of answers. I’m also going heavy on my sideboard countermagic and graveyard hate, as I have found that the mainboard configuration holds its own very well against most creature decks, so I can devote lots of space to hedging against combo and control. Overall, I feel the deck is somewhat underrated. Not many people talk about Merfolk or consider it a serious contender, but as I’ve had consistently positive results with it online and in paper, I sought to validate my findings against stiffer competition at the Classic. I arrived with a bit of time to spare, which let me take a quick look around the room. The first thing that struck me was the amount of people intending on entering the Classic. I never heard a final tally, but I believe over 300 players participated, which likely meant I would have to go through nine rounds of Swiss, and do very well in order to prize. I saw a wide variety of decklists being written up, so I had to be prepared to face pretty much anything. I did my best to take detailed notes throughout the course of the day, but the details of some matches stood out more than others. This section summarizes my feelings on the matchup, the result of the match, and my progress in the tournament at the top of each entry. It also gives a brief description of what cards I sideboarded in or out and why. This is a matchup that can be a little rough preboard as cards like Spreading Seas and Harbinger of the Tides do next to nothing, but with extensive postboard hate to bring in, I actually feel pretty confident in it overall. Game 1 (draw): My opponent begins with the traditional fastland into cantrip, but stumbles on his second land drop despite a second cantrip. This gives me the ability to Vial in Cursecatcher when he attempts to cantrip on Turn 3, giving Master of Waves time to bash in for lethal. Game 2 (draw): My opener is light on pressure but stuffed with hate. Dispel, a Negate, a Dismember, and a Relic of Progenitus all figure to be useful, so I keep it. I quickly remove my opponent’s first cost reducer, stick my Relic, and slowly ramp up the pressure while holding up countermagic, and my opponent is unable to find a foothold, in part because of a deluge of topdecked lands. I bring in all of my relevant countermagic and graveyard hate, as well as Echoing Truth to out Storm’s Empty the Warrens plan. On the outbound side, Harbinger and Seas do very little, and Master is a step too slow here. Dredge is another matchup I feel comfortable with, this time thanks to Master of Waves providing a way to come back from Conflagrate. Things only get better postboard, as the full playset of Relic is a beating for such a graveyard-centric strategy. Game 1 (play, mull 6): Despite my being on the play, my opponent gets off to a pretty solid start, finding three copies of Prized Amalgam along with some Narcomoebas and Bloodghasts in his first few dredges. However, choosing to go for a natural draw on one of his turns cracks open the door, and some Reejerey-Vial shenanigans allow me to steal the game. I’ll describe that situation in a bit more detail, as I felt that it was one of the coolest sequences I was involved in during the tournament. My opponent cast Life from the Loam followed by Conflagrate to wipe my board, then moved to combat with a gaggle of creatures. I had two copies of Aether Vial on the battlefield. One had three charge counters, and deployed a Watertrap Weaver to tap down an Amalgam and preserve my life total. I untapped at 6 life, activated Vial in response to its upkeep trigger to bring a Merrow Reejerey onto the battlefield, then ticked Vial up to four charge counters. I then drew a land and used it to cast my second Weaver, which tapped down another Amalgam. The Reejerey trigger from casting this Weaver untapped my Vial. On my opponent’s turn, he cast the aftermath mode on Driven // Despair in an effort to force some awkward blocks, but my last card in hand was Master of Waves. I Vialed in Master after my opponent had declared attacks, blocked just enough creatures to end my opponent’s turn on my last point of life, then dealt lethal damage on the crackback. Phew! Game 2 (draw): My opponent never really got off the ground on this one, as Seas combined with bounce effect after bounce effect kept the battlefield clear for my Lords and a late Master of Waves to beat him down. Despite Reejerey’s Game 1 heroics, he’s generally a bit of a risky play in this matchup, as he costs too much to quickly pressure the Dredge player, but also doesn’t have the massive comeback potential exhibited by Master of Waves. Dismember does little against a deck with so many recursive threats. Game 1 here is pretty close, with Merfolk having a bit of an edge thanks to Spreading Seas. Postboard, this is one of the matchups my counterspell-heavy sideboard is built to face. Game 1 (play): I come out with guns blazing, and quickly threaten a turn four kill. My opponent attempts to slow me down with Fatal Push and a turn four Ugin, but a couple of Mutavaults finish him off. Game 2 (draw): This game went long, in part because I drew quite a few lands early. However, I was able to keep my opponent off Tron for a time with Seas, then bounce my Seas in response to an Oblivion Stone activation with Echoing Truth in order to reapply the lock. That combined with some counterspells for his bombs, and a few islandwalkers were enough to get past his Thragtusk and seal the deal. This is a matchup where Merfolk needs to go heavy on the tempo. Tron packs little removal other than sweepers, which the counterspell lineup is built to negate. You want to deploy aggressively in the early game, slap a Seas on their Tron lands if you can find it, and then attack while holding up countermagic. This is the matchup I feel most confident in as a Merfolk player. Seas effects are very painful for such a red-hungry deck, and the painless manabase combined with cards like Aether Vial to dodge Eidolon of the Great Revel and Master of Waves as a curve topper they can do little about make me a convincing favorite. Game 1 (play): We trade cards at first, but my opponent is no match for the Master of Waves that follows my early Silvergill Adepts and Harbinger of the Tides. He gets me to single digits, but can’t quite finish it before being overwhelmed by a swarm of Elemental tokens. Game 2 (draw): My opponent finds pretty much the ideal hand against Merfolk. Swiftspear into Eidolon into Searing effects on the play puts a bit too much damage on my ledger, and my tap-out attempt at a comeback is thwarted by Boros Charm. Game 3 (play): An early Spreading Seas cripples my opponent’s ability to cast his spells on curve, and Lords on offense with Master of Waves on defense run away with this one. Countermagic comes in against Burn to fight them on the stack. Reejerey is cut because having it Bolted or Searing Blazed is simply an unacceptable tempo loss, while Dismember actively helps my opponent’s gameplan. As anyone who’s been on either side of this matchup knows, this is tough sledding for the Merfolk player. It’s very difficult to draw enough disruption to make up for the difference in speed, and that disruption must be paired with a way to push damage through quickly or it still won’t be enough. Game 1 (draw): This is where I commit my first major mistake of the day. I decided to cast Harbinger of the Tides despite having an Aether Vial on two charge counters. 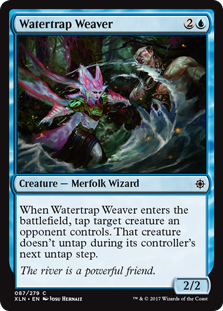 The decision precludes me from casting a Watertrap Weaver in that same turn, results in a round of Cranial Plating-fueled damage I could have avoided, and is ultimately the difference as I am one turn away from killing my opponent. Game 2 (play): My opponent mulls to five, but two of his cards are Whipflares. He manages to cast both of them in the same turn in order to bring himself back to card parity, and then topdecks a bit better on the empty boards. Rejection is the exact kind of card that’s built to address decks like Affinity, and Echoing Truth can be a nice catch-all. As usual in matchups this fast, Master of Waves is too slow. This grindy, value-focused deck can sometimes drag Merfolk into the mid-to-late game by virtue of having beefy blockers, but my experience is that it generally just gets outmuscled by the Lords and the evasiveness provided by Spreading Seas (though they do have a ready answer for that in Ghost Quarter). Game 1 (draw): My opponent mulls to five, and I have a hand stuffed to the brim with Lord effects. He puts up a token amount of resistance, but we’re on to Game 2 pretty quickly. Game 2 (draw, mull 5): This time, it’s my turn to mull to five. However, I topdeck two copies of Merrow Reejerey, and those combine with Master of the Pearl Trident and a steady stream of Cursecatchers to tap down my opponent’s blockers and keep my opponent from casting Collected Company. GW Company is highly graveyard-centric, so attacking them on that axis typically yields good results. I also bring in some disruption against Company or Path and a way to clear away blockers. Harbinger is of questionable value because the deck is typically playing defense against Merfolk, and while Master of Waves could be kept in for its army-in-a-can effect, I generally prefer to stack Lords and outmuscle them. Combo-control decks with a relatively slow finish, limited amounts of removal, an Island-based manabase, and some virtually irrelevant disruption in Blood Moon are about as good a matchup as I can ask for. This is especially true because most of them prep very little for the Merfolk matchup, and thus only have a token amount of sweepers postboard. Game 1 (draw): My opponent cantrips but misses a few land drops, which lets my Vial-powered hand overwhelm his disruption pretty easily. My opponent casts a Deceiver Exarch in an attempt to slow me down, but it’s no match for Master of Waves backed up by Lords. Game 2 (draw): My opponent attempts to disrupt me using Remand and Electrolyze early, and then taps out for Vedalken Shackles while Reejerey is on the battlefield. Unbeknownst to him, I have the second Reejerey and the requisite land in my hand to make my board state spiral out of control before he can untap and employ the artifact in any meaningful way. While this was not literally a turn four kill, I was insurmountably ahead by then. Because this combo is creature-based and can be interrupted by Harbinger, I’m worrying less about disrupting any graveyard synergies or countering big noncreature spells and more about putting on a fast clock with my plethora of evasive creatures. Master of Waves also stays in due to my opponent’s almost complete inability to answer it. While this matchup can be challenging for the more inexperienced Merfolk players, I find it to be pretty good: I can grind along with Jund in ways other creature decks cannot, manabase disruption often hurts Jund badly, and I have a threat they struggle to remove in Master of Waves. The key is to recognize that Aether Vial is a bad card in this matchup, and to side it out. Game 1 (draw): This game goes about as well as it possibly could for me. Double Spreading Seas on Blackcleave Cliffs takes my opponent off both black and red, significantly stymying his development. I then find double Master of Waves and quickly close the game. Game 2 (draw): A significantly closer game than the last, thanks in large part to an early Dark Confidant that goes unanswered continually flipping over cheap removal. This time, double Master of Waves allows me to come back from a precarious board state, and my opponent never finds revolt for his Fatal Pushes and is promptly killed. In a sense, my Merfolk deck is pre-boarded for Jund thanks to the deep creature count and the manabase interaction; all I really want is a way to attack the graveyard. Counters Company decks are generally tough matchups for Merfolk, as we only have a handful of ways to disrupt the combo preboard, and the speed at which it can be assembled is a definite issue. However, Bant is likely the easiest of those decks for me to face, thanks to islandwalk being live a higher percentage of the time. 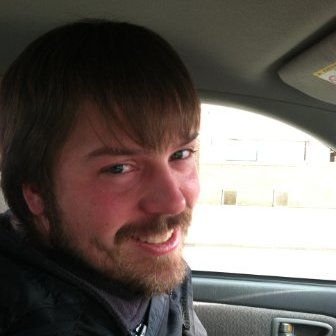 I wouldn’t consider myself to be favored, but I think I have game. Game 1 (play): My opponent manages to line up a Spell Queller with a Lord, but double Master of Waves overwhelms his ability to block. My opponent doesn’t show me any Chords or combo pieces, so I incorrectly assume he is on Knightfall. Game 2 (draw): The assumption that he is on Knightfall ends up biting me, as I fail to play around the combo and proceed to die to it one turn before I can present lethal. Game 3 (play): This is where I committed the mistake that more than likely kept me out of Top 8 contention; my opponent attempts to cast a Worship while I have a Negate in hand and two blue mana open, but my relaxed language upon seeing the card lets the card through. We then end up in a tight race, which he wins thanks to being able to hold up his Queller to catch my Echoing Truth rather than the other way around. I got sloppy at the worst possible time. I’m looking to interact on the stack more in this matchup, so counterspells come in. Most of the deck’s backup plans involve the graveyard in some way, so I bring Relics to shut that off. This is one of the rare creature-based matchups in which Weaver doesn’t do much; I outmuscle my opponent’s forces pretty readily, and it doesn’t disrupt any of their combos. Master is just a bit too slow, and Seas is not critical given the presence of Islands and the lack of truly scary utility lands. While a Top 16 finish is certainly nothing to sneeze at, I do feel like I left a Top 8 berth on the table with a couple of less-than-optimal moves that would have allowed me to steal games from bad matchups. My sloppy play aside, I think my run clearly demonstrates my initial claim: Merfolk has game against the current field. The proactive plan is strong and consistent, most of the matchups I faced were 50/50 or better, and you can generally scratch together enough disruption to affect your opponent’s gameplan and help the rush hit home. I may try out UG Merfolk the next time I get a chance to participate in one of these larger paper events, as it is slanted even more toward proactivity, but I feel very comfortable with my mono-blue list, and am confident it can thrive in most environments. If you have any comments or observations, feel free to drop me a line in the comments. Nice finish for fish Roland. I knew I recognized that name as soon as I saw it. My first modern deck is merfolk and it hasn’t been changed for quite some time. I don’t think I’ll be changing it anytime soon now. Mono blue does seem a tad slow though so maybe another 1 drop might not hurt? I’m thinking either Cosi’s Trickster or Mothdust changeling. I’ve haven’t tested Watertap Weaver yet but another 3 drop feels really slow. But now that I think about it, the weaver can gain you huge tempo by keeping their best threat tapped for two whole turns. And when it comes back to your turn you can bounce it with a Harbinger. These are the effects that blue has been in need of if they aren’t going to give it a decent counterspell at 2. I’d love to have another 1-drop, but I feel the current suite of options just isn’t good enough. Part of the reason I think UG has been doing so well in my hands is because of the second quality 1-drop; maybe one day we’ll get the same for mono-U. In the meantime, Weaver has proven capable of catching me back up. From having my own U/G and mono U fish lists, my overall understanding is that mono blue is much better in the current meta. Access to more blue and double blue effects makes punching through with master of waves easier, and easier access to casting cards like spell pierce and unified will makes combo matchups much easier. Along with this, there is far more blood moon running around, which is quite good against blue green due to sheer amount of non basics. i’ve been a huge fan of kopala over Kira and currently really dislike watertrap weaver, preferring to have mainboard spell pierce in that slot instead and overall feel that having that makes the counters company matchup alot easier on us (along with switching dismember for vapor snag) but, that has just been my experience. If their are more decks like Abzan and mardu pyromancer and midrange decks running around, I think U/G’s clock is much more efficient against them, especially since the dismember is much better against those decks that play to the board so much, but as it stands, ill take the 12 island mono blue deck any day with the current metagame. Mono-U is certainly better than the UG version as of Ixalan, but Rivals has complicated things. I’m currently piloting a Tropical Fish list on MTGO and winning at rates higher than anything I’ve achieved with mono-U. 16 Lord effects is the real deal. As for the use of the flex spots, I’ve found that Pierce and Snag are pretty poor against Counters Company. It’s pretty trivial for them to slap together enough assorted dorks to ramp past Pierce’s tax, and Snag is usually pretty irrelevant given that they can just recast combo pieces and have a pile of ETB effects. Decks like Company and Storm are the reason I maindeck Dismember over Snag (which I have otherwise preferred). Weaver’s inclusion is a bit more contentious (as I too have had some notable success with Kopala), but it came down to the fact that I expected decks like Humans, where Weaver is awesome and Kopala/Pierce are a blank. What variant to side with if midrange decks become all the rage is actually a pretty tough question. I think that Master of Waves wins you lots of games you would otherwise lose by giving you a way to come back from behind, but UG is better at forcing the opponent to find an answer early or die. Given the density of answers present in the typical midrange deck, I think I’d give a slight nod to mono-U.